Well, wait a minute. Is it “God Bless the U.S.A.” with periods or “God Bless the USA” without? Is there a rule? Oh, you probably have a preference, but how do you know you’re right? The answer, somewhat unhelpfully, is that it depends. Periods vs. no periods isn’t actually a question of grammar, but of something far trickier: style. And while the rules of grammar are a product of consensus, based on observation and description of the ever-changing ways in which people use the language, the rules of style derive purely from an appeal to authority. These rules do not arise organically but are handed down by self-appointed arbiters usually speaking for an affiliation of publishers. The Chicago Manual of Style (CMS), for instance, serves as the argument-ender for hundreds of magazines and newspapers; the Associated Press Stylebook serves the same role for hundreds more; the American Psychological Association’s Publications Manual is the last word for a host of academic journals in the sciences, and the Modern Language Association Handbook serves journals in the humanities. The rules in these guidebooks are often arbitrary, but they are internally consistent, and that’s all they really need to be. At ProofreadingPal, we edit for both grammar and style. Most of our proofreaders are well-versed in several style guides and our clients can ask for whatever they like, but we use the CMS as our default. The CMS takes many definitive stands, but surprisingly it largely punts on the USA vs. U.S.A. controversy. Section 10.33 of the 16th edition recommends spelling out “United States” when using the country’s name as a noun (e.g., “Walmart is a retailer with stores across the United States.”). For use as an adjective, however, section 10.4 specifies “US” without periods or the “A” (e.g., “The US retailer Walmart is expanding its operations in Canada.”). 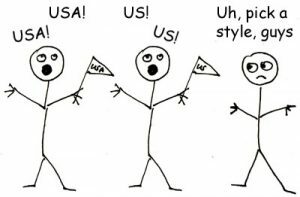 The only answer to the “USA” issue come by inference: CMS-compliant patriots can now belt out “God Bless the USA” unencumbered by any notional full stops. Joan is a lifelong Arkansas resident. Frank was raised in southeastern Arkansas. Claudine was born in Little Rock, AR. Arkansas retailer Walmart added 200 jobs at its Bentonville headquarters. Arkansas Governor Asa Hutchinson expressed his gratitude. Senator Tom Cotton (R-AR) praised the retailer. Adherence to any particular style guide is a sort of social contract; binding ourselves to a shared set of rules may not solve every problem of communication, but at least we can know what to expect.